Our week 23 nominee for the Lexus of Richmond Leadership Award is Olivia Walker of Cosby High School. Ranked 10th in her class with a 4.7 GPA, Olivia is a member of the National Honor Society and Latin National Honor Society. For three straight years, she was selected as the Latin Student of the Year. She attended the Summer Residential Governor’s School and participated as a Junior Marshal. Olivia is a Finalist for the Jefferson Scholarship at UVA and received the Provost Scholarship at VCU. Being a member of the varsity volleyball team at Cosby, Olivia was the team captain this past season. During her time on the team, she was presented the Heart and Hustle Award and was selected for the All Tournament Team. She has also been a part of a travel team and a beach volleyball team; both through the Richmond Volleyball Club. Olivia is also a well-versed dancer. She competes as a part of the Heart of Ireland Celtic Pulse Dance Company where she was a World Qualifier in the Open Level for both softshoe and hard shoe. Outside of Irish dance, she has trained in ballet, tap, jazz, contemporary, lyrical and hip hop. At Cosby, Olivia is a member of the Beta Club and Latin Club as well as the Health Occupations Students of America. She is the President of the National Honor Society. Olivia is a member of two show choirs: Spotlight and Rhapsody. Olivia spends time volunteering for the Children’s Hospital of Richmond and Safe Kids VA. She also performs at various nursing homes in the area. She has been a camp instructor and a coach through the Richmond Volleyball Club Outreach program. Other programs she has worked with include; the PTA at CE Curtis Elementary, Vacation Bible School, and Friends Feeding Friends. Olivia has even founded a service called Re-Turn Dancewear. Olivia has won a dinner for two and is now in the running for the $10,000 scholarship. 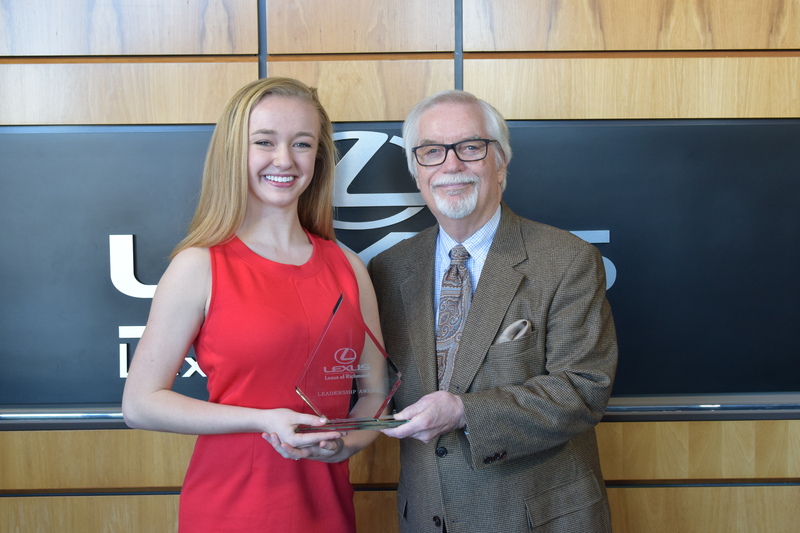 Watch the Fox Richmond – WRLH interview and the Lexus of Richmond Leadership Drive interview to learn more about Olivia! Remember to check Facebook for more information about each weekly nominee throughout the school year!